Head lice are commonly seen in kids between the ages of three and 12. It’s no coincidence that lice infestation occurs in school-age children. Kids, especially young ones, tend to come into close contact with each other during play, allowing lice to spread like an epidemic, often throughout the whole school. The story that lice are attracted to dirty hair is an urban myth. These irritating pests will happily inhabit the cleanest, shiniest hair, as well as tresses that are not so well-kept. Once your kids have lice, there are lots of lice shampoos and other safe-to-use pesticides that can be used to kill them. But is there anything you can use to repel lice and prevent an infestation in the first place? Can essential oils repel lice? Most parents don’t like the idea of using toxic chemicals to repel lice. And the bad news is that lice are now becoming resistant to the effects of commonly-used pesticides such as permethrin. However, the good news is that certain essential oils have been scientifically proven to be sufficiently potent to repel and even kill adult lice, nymphs, and nits all at once. You can make an essential oil lice repellent spray yourself, using three main ingredients; rubbing alcohol, water, and anti-lice essential oils. 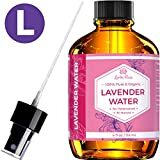 Lavender hydrosol is a floral distillate that is extracted from the flowers of the lavender herb as a by-product of the essential oil extraction process. The scent given off by highly-aromatic lavender water is a natural insecticide and makes an excellent base for your essential oil lice repellent spray. You can buy lavender water online or from natural remedy retailers. LIGHT SCENT - this calming aroma naturally relieves headaches and stress. Put this oil on nightly before bed, and the soothing qualities will prepare you for a restful sleep. All these essential oils contain compounds, including methol, eugenol, and linalool. All these compounds are highly aromatic plant terpenes that have very effective insect repellent properties. You can buy all these ingredients online through Amazon.com via the handy links we’ve provided. You only need a few drops of each oil to make the lice repellent spray, so you will be able to make quite a few batches from each bottle of oil. The final ingredient you’ll need for your lice repellent spray is rubbing alcohol. Rubbing (isopropyl) alcohol dissolves the essential oils when combined with the lavender water to make a useable spray. You’ll also need a large plastic spray bottle (8oz). If the oils you’ve bought don’t come with a dropper included, you’ll need to buy one. Also, you may find that using a funnel helps to avoid spills when pouring the lavender water and rubbing alcohol into your spray dispenser. Carefully measure out all the ingredients into a large plastic spray bottle, using your funnel to prevent spills. Screw the bottle lid securely, and give the bottle a vigorous shake to ensure the contents are combined thoroughly. And you’re done! Using the spray is quick and straightforward. If your child has long hair, put it into a braid or fix it up in a bun; trailing hair is more likely to come into contact with other kids’ hair and potentially pick up lice. Shake your spray bottle vigorously, and then spritz your child’s hair liberally with the repellent so that all their head is treated. So, what about babies and infants? It’s possible for a newborn or an infant to contract lice from an older sibling. Lice are extremely contagious and just one cuddle can transfer lice from one head to another. Biting lice can be extremely distressing for babies and infants whose skin is delicate and sensitive. Most over-the-counter treatments for lice are not recommended for babies and infants under two years of age. That’s because the pesticides contained in these products contain hormone disruptors, known-carcinogens, and CNS (central nervous system) disruptors, which can pose a danger to very young children. Can you use essential oils for preventing lice in infants and babies? Essential oils are not generally recommended for babies under three months of age or for infants. That’s because baby skin is very porous and will absorb some of the oils. For babies over six months of age, certain essential oils can safely be used to prevent lice, provided the oils are diluted in a suitable carrier oil such as olive or coconut oil. You’ll need to choose a carrier oil such as olive oil or coconut oil. You’ll find both of these in your local grocery store. A small glass jar can be used to store the lice repellent once it’s made. Combine all the ingredients in a glass dish so that everything is mixed thoroughly. Once a day, in the evening before you put your baby to bed, gently use your fingers to apply the repellent liberally to your child’s scalp. This essential oil is useful as a repellent, but if you’re concerned that your infant has contracted lice, always consult your family doctor for advice. Essential oils can be used to make an effective lice repellent spray that will help to keep lice away. However, if you or your kids have a lice infestation, be sure to use appropriate lice killing products to get rid of the parasites. Once you and your family are all-clear, you can start using the essential oil lice repellent spray as a protective measure against future infestations.